LAS VEGAS — Content workflows migrated to the cloud, automated metadata using artificial intelligence and machine learning, better recommendation engines geared toward attracting and retaining viewers … members of the Media & Entertainment Services Alliance (MESA) treated attendees of the 2019 NAB Show to their latest solutions during a digital asset management (DAM) tour April 9. 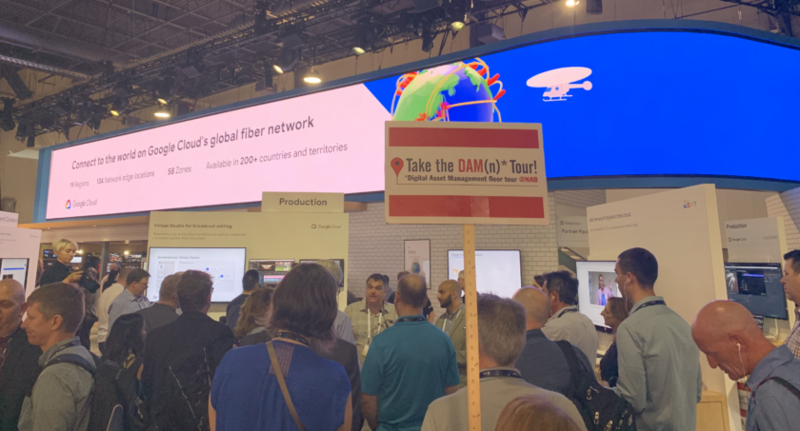 “We want to think holistically about our approaches and who we partner with,” a Google Cloud rep said during a stop of the DAM NAB floor tour. Google Cloud was one of eight companies to show off their DAM solutions on the day, sharing an overview of Google solutions for broadcasters and media companies, covering cloud-based production, asset management, distribution, analytics, and more. On the tour, ThinkAnalytics showed off its Emmy award-winning AI and machine learning technology, giving attendees and idea of how better recommendations often make for more engaged and loyal consumers. Meanwhile, 5th Kind showed off its CORE Studio Asset Management solution, supporting production workflows, covering everything from art VFX, to studio dailies, to marketing distribution. 5th Kind also showed off 5th Kind’s CORE integration with IBM Aspera. For Teradici, the DAM tour consisted of a live demonstration relaying how content workflows migrate to the cloud via Teradici Cloud Access Software, putting an end to cloud latency issues for creatives, and offering remote collaboration without sacrificing high-quality user experiences. For Vistex, their solutions for SAP and cloud were front and center, showing how the right DAM system can unlock supply chain value by spotlighting your content rights, restrictions and available usage. “Integration with the tools you use every day [and] a range of 400 different engines to run content through,” was what Garron Bateman, senior sales engineer for Veritone, touted for his company’s white-label digital asset management solution, which is integrated with AI. He shared client use cases, highlighting how they’ve applied cognitive metadata to enable richer search, enhanced access, and increased monetization. GrayMeta’s Curio solution — connecting all cloud and on-premise storage locations via one interface, with built-in AI and machine learning — was highlighted by the data company, as it showed how crucial automated metadata collection can prove to be. GrayMeta Curio helps companies create, extract and store intelligent metadata, allowing for expanded searchability across applications. “Virtual linear channels, and personalized channels for every viewer … a personal feed to each and every viewer,” was how Jason Friedlander, senior director of product marketing for Verizon Digital Media Services, described his company’s cloud platform. Both new brands and huge broadcasters are looking to VDMS to deliver TV quality at scale, and finding new ways to deliver personalized viewing experiences using VDMS’ Smartplay technology.